and longevity into your vision. We provide inspiration and innovation! Get more leads and close more deals. Our goal is to give additional visibility to your company. We can create the perfect advertisement solution for your business. We create ad campaigns that will bring customers right to your door. We set up a networking environment as an effective resource to help put you in the right path for your endeavors. We keep our deadlines and keep you informed of any changes and progress on your project. We don't waste time. We start brain storming on your project right away. ICE Media Entertainment has two media outlets in the form of radio and magazine. These specialized brands main goal is to bring greatness to light through inspiration, innovation and empowerment. If you offer a service or product or own a venue and you are looking for ways to increase sales and visibility, please contact our sales team: sales@icemediaent.com. We offer a variety of personalized solutions to help build your brand. Our approach is strategic, carefully designed and planned out to meet your purpose and long term goals. We have successfully worked with and created campaigns for athletes, public figures, non-profits, business start-ups and entities within the fashion and entertainment industries. 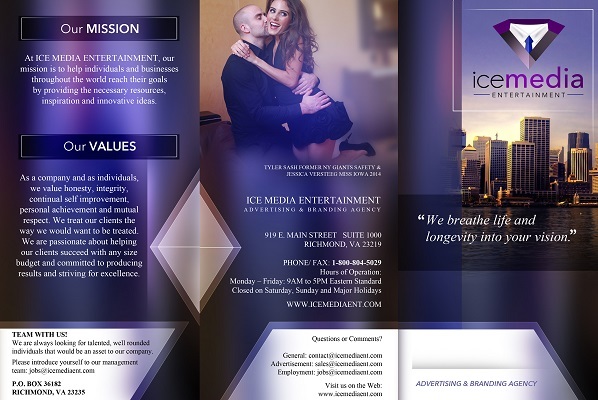 ICE Media Entertainment is a global Advertisement and Branding Agency. As a full service agency, we offer two media outlets in the form of radio and magazine. Networking Events, On and Offline Conferences. Content Syndication, Subscriptions to Exclusive Content, Member Spotlight. As your Personal Catalyst, we do the necessary research to fully assess your specific needs. This allows us to put together the right combination of services to help you achieve your goals. As a company and as individuals, we value honesty, integrity, continual self improvement, personal achievement and mutual respect. Our Management Team has over 75 years combined experience in business start-ups, public relations, marketing and entertainment. We put together the right combination of services for your specific needs and goals, acting as your personal catalyst.